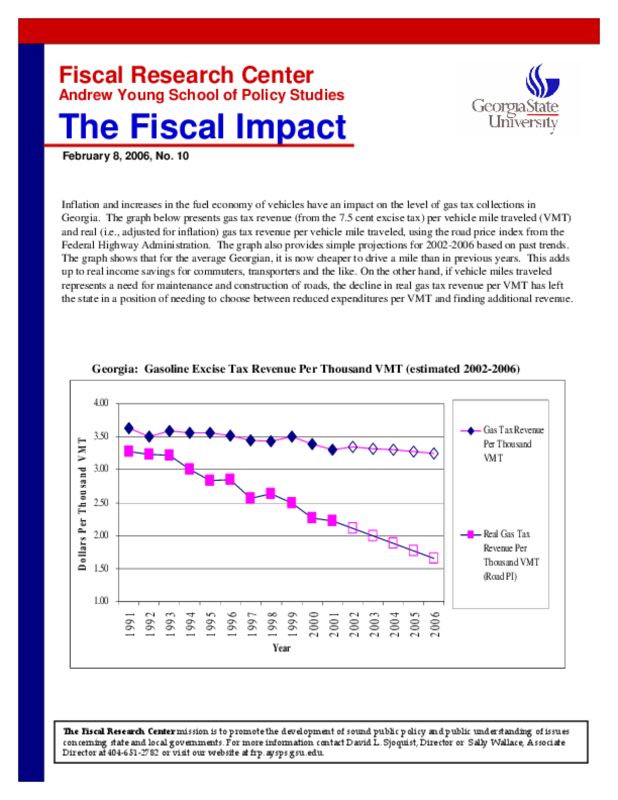 Inflation and increases in the fuel economy of vehicles have an impact on the level of gas tax collections in Georgia. The graph below presents gas tax revenue (from the 7.5 cent excise tax) per vehicle mile traveled (VMT) and real (i.e., adjusted for inflation) gas tax revenue per vehicle mile traveled, using the road price index from the Federal Highway Administration. The graph also provides simple projections for 2002-2006 based on past trends. The graph shows that for the average Georgian, it is now cheaper to drive a mile than in previous years. This adds up to real income savings for commuters, transporters and the like. On the other hand, if vehicle miles traveled represents a need for maintenance and construction of roads, the decline in real gas tax revenue per VMT has left the state in a position of needing to choose between reduced expenditures per VMT and finding additional revenue.